it would be natural to suppose that together with the described above peripheral effect, which isdetermined by the secretion of the biologically active substances , Scenar must render and the central influence which mobilizes the regulating mechanisms of the self-recovery system of the organism. It could be connected with the moments of synchronism of the brain electrical activity with the leading role of the anterior parasygmatic hypothalamus, which coordinates the activity of the vegetative system in the mode of self restoration . The aim of this work is the experimental testing of the hypothesis, given above and the search of the possible ways to strength the central effect of the Scenar stimulation. As the direct research of the intracerebral structures activity isn’t ethical, and mammals nervous system including the human beings, has very much in common, the research of the central effect was began on the animals with the prospect of usage of the received results in people treating. One of the main tasks was the working-out of the Scenar- stimulation effectiveness criteria. visual areas. Scenar-influence was carried out, mostly, on the shoulder surface with the frequency of 59,3 Hz. For the study of the central effect of the Scenar influence the 30-minutes stimulation was used. We found out the increasing of the power of the oscillations in the low frequencies area and the obvious tendency to the development of generalized activity on every lead at the time of irritation and after it. During that in the electrogrames of the guinea pigs the alpha–like spindles (pic 1a) was observed, and in the electrogrames of the kept- awake rabbits, there were, beside that, the outbursts of the oscillations in the sigma rhythm and the appearance of the K-complexes (pic.1b). Such forms of activity, as it is known, are revealed during the sleep with its heightened tone . Behavioral reaction of the animals is also the evidence of the paradigmatic tone increase. The animal stops to hold the head (weakening of the antigravity muscles), behaves calmly, eyes fall behind (endophtalamitis is the clear sign of the increasing of the parasympathetic tone). The examples of the electrograme registration of the brain structure of the guinea-pig: A)1,2–Visual cortex; 3,4–somatosensory cortex; 5,6? the anterior hypothalamus; 7,8? the posterior hypothalamus. B) 1,2- Visual cortex; 3,4 somatosensory cortex; 5,6 the posterior hypothalamus;7,8- the anterior hypothalamus. The analysis of the Scenar-stimulation effect development on the spectrums of power regularly showed the increase of the slow-wave oscillations in all investigated leads. In some cases the maximum synchronization was observed in 15 minutes but more often it was developed during the first 15 minutes of the stimulation.(pic.2b.c.). The repetition of the appearance of the generalized synchronization from the experience to the experience is the evidence of the regularity of this event (p<0,01, the criterion of the signs) as the result of the Scenar-influence. Thus, the main electrtographic effect is revealed in the generalized slow-wave activity of the brain structures. 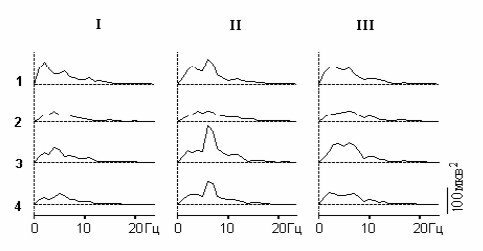 The examples of the activity development dynamics in the brain structures at the prolonged Scenarstimulation, traced on the spectrums of the power for the guinea-pig(A) and the rabbit(?)–shoulder,(? )-the head against the background(I), 1,5 minutes after having the influence(II), 15 minutes after having stimulation(III), 30 minutes after having stimulation (IV) and then (V) 1–visual cortex; 2?somatosensory cortex;3?anterior hypothalamus;4?posterior hypothalamus. The peculiarities of the Scenar influence on the different areas of the brain lied in the fact, that the synchronization was better pronounced for the anterior hypothalamus then for the posterior and for the visual cortex than for the somatosensory cortex. Such results could be observed and afterwards. At that, as it was cleared up during the additional treatment of the materials the earliest signs of the synchronization are observed in the somatosensory cortex. The fact of the more pronounced activity of the anterior parasympathetic hypothalamus in comparison with the posterior one sympathetic is the evidence of the leading role of the first one and denotes the increasing of the parasympathetic tone under the influence of the Scenar therapy. High co-ordination of the activity changes in the visual cortex and in the anterior hypothalamus was found. It turned out to be that the activity of these structures is highly correlated for the rabbits and for the guinea pigs as well In general taking into account the extracts P<0,001. The marked fact let us judge about the increasing of the anterior hypothalamus activity (the growth of the parasympathetic tone) on the indices of the synchronized activity of the visual cortex and could be used as the criterion of the Scenar-influence effectiveness and also in the EGG researches. The fact of the major reaction of the visual cortex, instead of the somatosensory after the electroskin irritation is paradoxical on the face of it. But it should be taken in account, that we observe the already developed systemic effect of influence, which covers many structures of brain. It goes without saying that the center of the activity, created by the Scenar- stimulation appears primarily in the somatosensory cortex. This causes the activation of the synchronizing system with its important unit–the anterior hypothalamus. 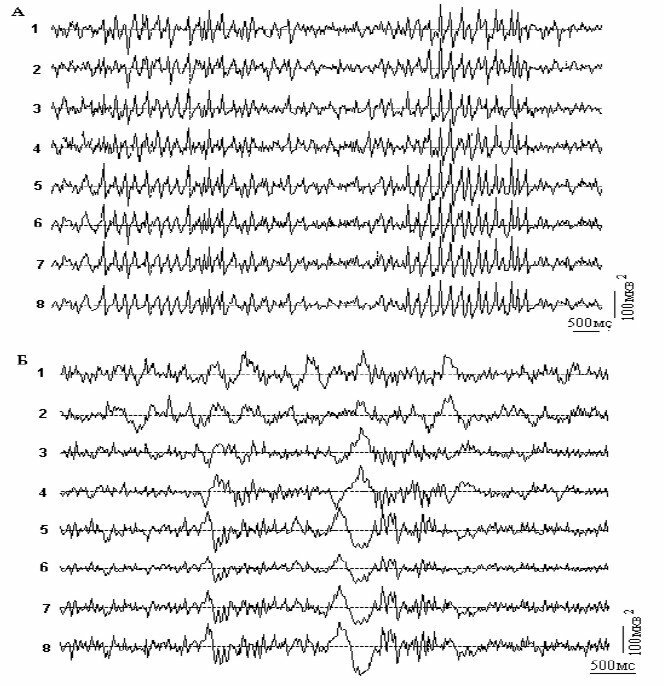 The anterior hypothalamus, in its turn, as it appears from the results, and as it was proved by N.V.Suntsova  for other animals, causes the generalized synchronization, characterized by high correlation in the field of the alpha-like oscillations for the anterior hypothalamus and the visual, but not somatosensory cortex. The increased activity of the anterior hypothalamus, determining the increase of the parasympathetic tone stimulates alpha-activity and after that. This fact deserves a special attention. According the Garcavy’s researches  such electro?physiological picture is the correlate of animals and people anteaters reaction training With its very development the researchers pin the important sanitary consequences, in particular, the treating effect of the Scenar device. 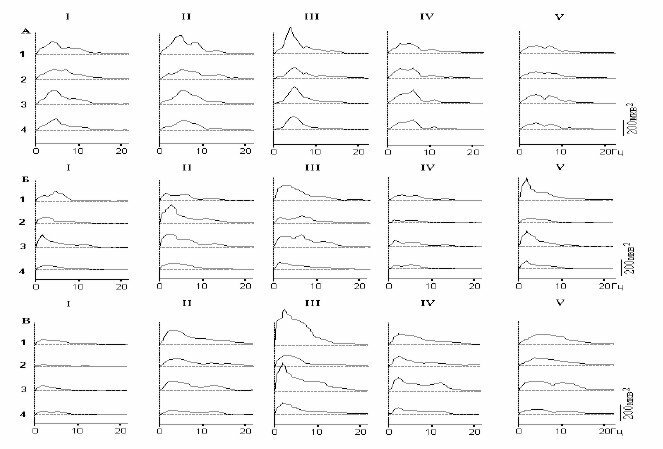 Taking into account all the data given in the literature, our results show that the development and keeping afterwards the increased alpha-like activity in the visual cortex, especially after the Scenar-stimulation (pic 2,A,B,C,) can be regarded and as the criterion of the Scenar influence effectiveness and as pointing out on the parasympathetic nature of these reactions. It’s known that the stimulation of the skull skin, which is characterized mostly by the parasympathetic innervation , has very good medical consequences. The irritation of the head’s skin (pic2B) with the help of the 24 needle electrode is characterized by a greater synchronization of the activity then when with the help of the same electrode the skin of the shoulder is treated. Let’s note the fact, that when skull skin of the rabbits was stimulated, they looked like sleeping?they closed their eyes. This fact points out a considerable increase of the parasympathetic tone. After such stimulation the increased slow-wave activity (parasympathetic tone) can be stored 24 hours after the Scenar treatment. The role of the synchronization of the slow?wave activity created by the Scenar on the analogy of that, during the state of sleep, can be connected with the easing of the access to the information about the “inner body” of the organism to the screen of the cortex, keeping the “standard of the healthy body” in it. A very important demand for this standard?the stability of the organization?is provided by that fact, that the cells of the brain cortex, unlike other cells of the body, are not replaced by the new ones during the life cycle. Under the conditions of the active staying awake, which is characterized by the desynchronized activity of the brain structures and high sympathetic tone, the cortex of the brain, as is well known, is unavailable or is available only for the very powerful signals from the inner organs. The different matter is the state of the sleep when there is a high synchronized activity (and parasympathetic tone) [3,7,8]. Similarly in one’s sleep generalized synchronization, created with the help of Scenar influence, makes it possible, that the signals about the state of the “inner body” of the organism can reach the cortex. It also gives the opportunity of the making of the corresponding correcting signals to the intermediate control levels and executive structures. Among them the structures of the front hypothalamus, changing the work of the vegetative system to the mode of the recovery, have the particular role. At that, because of the activity focus, created by the Scenar from the corresponding zones of the small asymmetry, the localization of the affection center is pointed out .Such condition is not the state of sleep, when the generalized activity is very probable. But the sleepy condition, developing, according the clinicians at the effective Scenar influence, is the evidence of the essential similarity of the concerned states .It is proved and by the introspection. available for the signals from all the inner organs, and among them-the increased with the help of the Scenar influence signals from the hearts of the pathology. ”Checking” of the organism state condition with the standard provides with the working out of the corrective signals, correlated with the state of the whole organism. These corrective signals, directed on the self-restoration are signals to the levels of the. Intermediate control, most of all to the front parasympathetic hypothalamus and to the executive systems. The achievement of the aim effort is provided with the help of secretion/isolation of the according biologically active substances. As an aftereffect the increased activity of the front hypothalamus is reflected in the according increasing of the alpha-activity of the brain cortex, especially of the visual area. I.e. if there is the sufficient parasympathetic tone, which reflects the activity of the organism, concerning its self-restoration, the increasing power of the alpha activity must be observed in the cervical leads. This is observed as the aftereffect of the Scenar-theraphy. The results of the comparison of the Scenar-influence on the shoulder and head areas which follows our research let us to speak about the ability of the increasing the Scenar-influence effect with the help of the combined use of the electrodes. One of the electrodes, the broad one should be placed in this or that area of the increased parasympathetic innervation-the surface of the head, the sacral, the erogenous areas. With the help of the broad electrode the general increasing of the parasympathetic tone is achieved. Another electrode, the remote one is used, as usual, on the according areas of the small asymmetry. This electrode points to the “address” of the according pathology. We investigated the effect, emergent at the combined influence of the electrodes on the symmetrical areas. It turned out to be that such kind of stimulation can reduce to the more pronounced effect (pic3). The combined effect of the narrow and broad electrodes from the symmetric areas of the skin surface (shoulder) causes the synchronizing effect at the 2-minutes’ stimulation: 1?the visual cortex; 2?the somatosensory cortex; 3?the anterior hypothalamus; 4?the posterior hypothalamus; I-before, II-against a background of stimulation, III-in aftereffect. Thus, it seems to be expedient to carry out the clinical tests with the application of the external Scenar electrode. Taking into account the picture of the aftereffect, revealed during the researches ,it seem to be possible to carry out the successive usage of the broad and external local electrodes?first the broad one on the zones of the high parasympathetic innervation and then (against a background of developed parasympathetic tone) external on the areas of small symmetry. 1. Grinberg Y.Z. the effectiveness of Scenar-therapy. Physiological aspects. //In “Scenar-therapy”, ”Scenar-expertise” collections of articles. Taganrog, 1998, issues 4-8. 2.Chebkasov S.A. Health strategy. The system of structures outstripping self-restoration. The problem of parasympathetic vegetative system activation. Valeology.2000. ?1 p. 80. 3.Karmanova I.G. –What we know about the cycle “staying awake condition-sleep condition” and the reasons of its disorders. St.Peterburg.1998. p. 93. 4.Suntsova N/N/ The anterior brain mechanisms of the sleep development.//Submitting for dissertation for the doctor’s degree. Rostov State university, Rostov-on-Don,2000, p.372. 5.Garkavi L.N. and others. Antistress reaction and activation therapy, M:IMEDIS,1998, p.656. 6.Luvsan Gavaa.Traditional and modern aspects of eastern medicine.M,1992, p.576. 7.Danilova N.N. Psychophysiological diagnostics of functional states, M,1992, p.192. 8.Nozdrachev A.D. and others. General course of human and animals physiology. //BookII Physiology of visceral systems. M,High school,1991, p.6-28.